The Ableware Dressing Stick is essential for anyone who has difficulty bending, a limited range of movement, or the use of only one arm or hand. 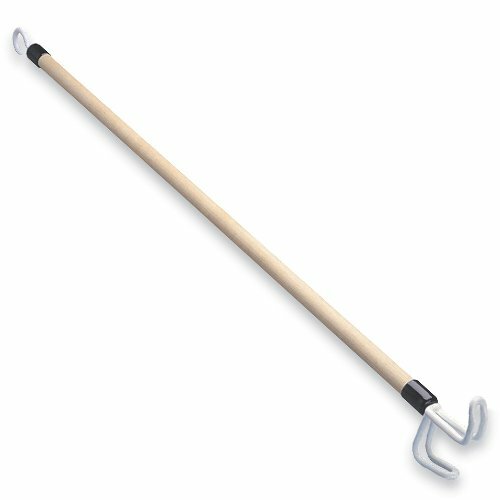 A plastic coated combination hook/pusher assists in putting on shirts and jackets, pulling up slacks or skirts, or removing socks. The small hook on the opposite end aids in pulling zippers and shoelace loops. Measures 24 inches (61 cm) long. The Ableware Dressing Stick comes with a one year limited warranty. Maddak specializes in home healthcare and rehabilitation products for the senior, disability and rehab markets. We have been recognized as the largest manufacturer in the United States of Aids for Daily Living (ADL). Maddak continues to design and manufacture products that increase mobility, maximize independence and enable people to live more rewarding, dignified and enriched lives.